Shortly after I posted this image on my blog, I heard from my friend Marion Manson, who had posted a similar photo and story on her blog. 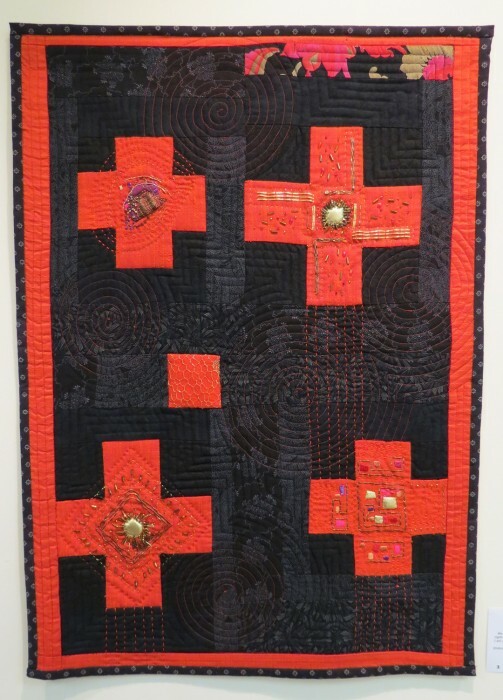 She was contacted by Lee-ann who gave her a link to her own blog that has the full, and fascinating story of how this quilt came to be. It’s worth a read! 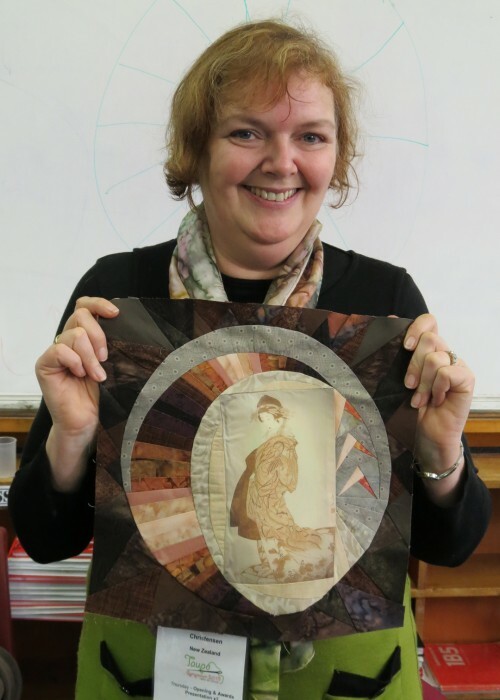 What a wonderful quilt with an equally interesting story. When her page opens, just scroll down to read the entire story. 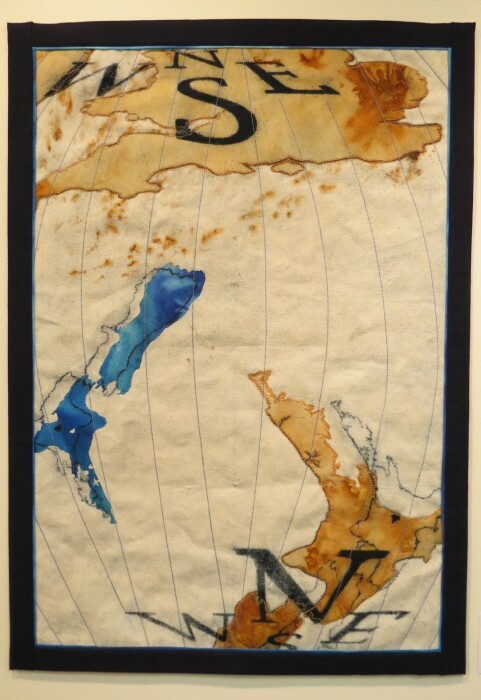 Now, lest you think that the Taupo Museum focused solely on fiber arts during my visit, at least half of the facility is dedicated to the natural and geologic history of this area, and of New Zealand. Having now spent a week in this region, I was well aware of the geologic history, and also current events. I was in Taupo when the largish earthquakes struck the North End of South Island and also Wellington, at the south end of the North Island. The smell of sulfur was overwhelming on the days of heavy geologic activity. 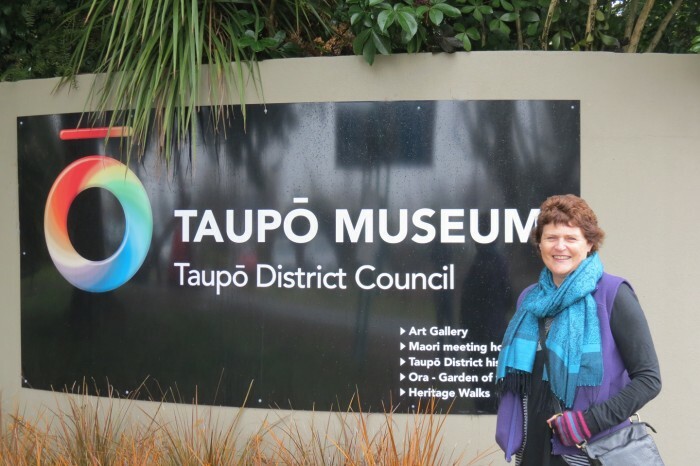 The museum covers much of the history of Lake Taupo and its origin. Taupo volcano last erupted over 1,800 years ago and is now filled by New Zealand’s largest lake. 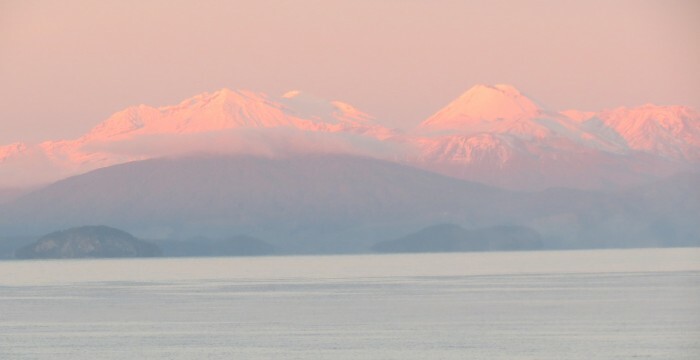 Taupo volcano first began to erupt over 300,000 years ago. It is very large and has many vents, most of which are now under Lake Taupo. Geological studies of Taupo show that the volcano makes up only the northern half of the lake and a small surrounding area but there have been numerous eruptions from different sites within this large volcano. Taupo is not a large mountain because the eruptions have been so explosive that all material has been deposited far from the vent and subsequent collapse of the ground has formed a caldera (a collapsed volcano). 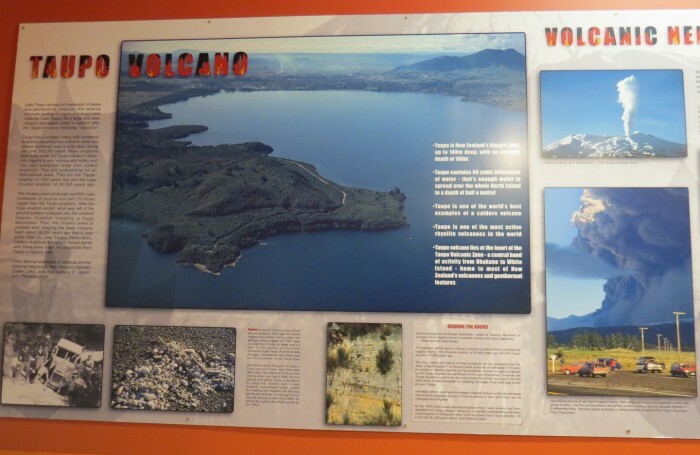 The museum includes a good exhibit of different types of volcanic rock formed during the various volcanic events. Above is scoria, which is a frothy volcanic rock formed from cooled anbesite or basalt lava, ranging in color from red to black. 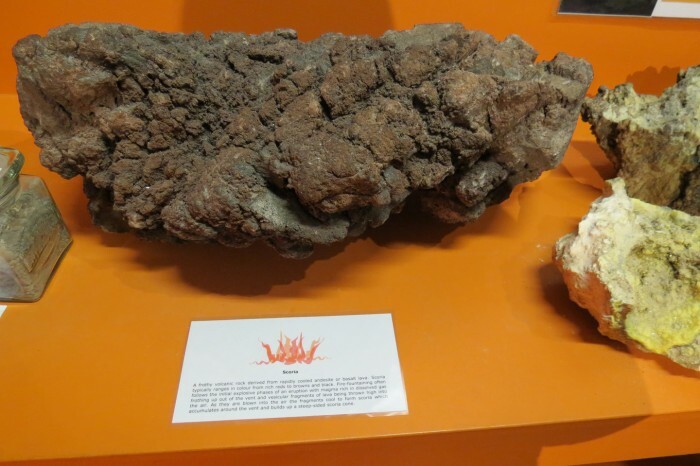 Its formation can occur from fire-fountaining when lava is blown into the air. The fragments cool to form scoria. The mountains to the west in Tongariro National Park are all volcanic. The three volcanoes at the heart of the park, the mountains Tongariro, Ngauruhoe and Ruapehu, form the southern limits of the Taupo Volcanic Zone, part of the Pacific Ring of Fire. Volcanic activity in the zone started about 2 million years ago and continues today. Ruapehu and Ngauruhoe are two of the most active composite volcanoes in the world. In 1995 and again in 1996 Ruapehu erupted in spectacular fashion, sending clouds of ash and steam skyward and mantling the surrounding snow fields and forest with a thick film of ash. 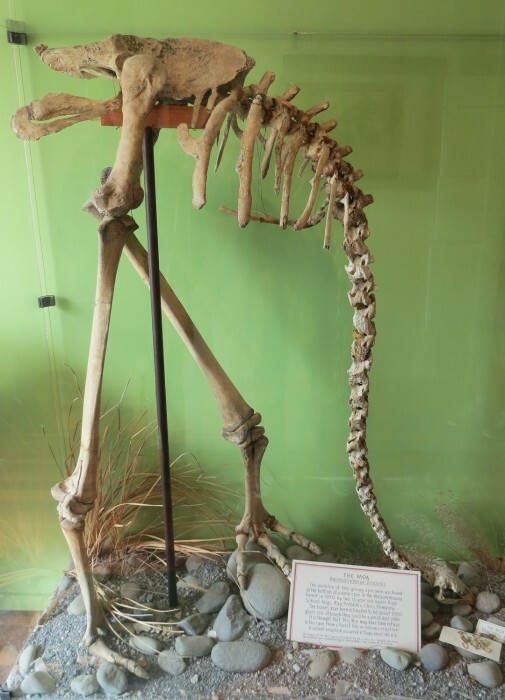 In additon to the exhibit about volcanism, the museum did have one relic of former avifauna, the flightless Moa that was quickly exterminated by the first Maori settlers.This skeleton is of a young Moa, found at the bottom of a deep cave in 1970 by two 13-year-old boys. The bones are estimated to be about 2,000 years old, although they could be older. It is thought that this Moa may have taken refuge in the cave during a forest fire or volcanic eruption. A violent eruption occurred at Taupo about 146 a.d. The Moa consisted of nine species of flightless birds endemic to New Zealand. The two largest species, Dinornis robustus and Dinornis novaezelandiae, reached about 3.6 m (12 ft) in height with neck outstretched, and weighed about 230 kg (510 lb). I found this impressive waka, made from a Totara tree in the south exhibit hall that focused on New Zealand’s human history. Waka are Maori canoes ranging in size from small, unornamented canoes (waka tīwai) used for fishing and river travel, to large decorated war canoes (waka taua) up to 40 metres (130 ft) long. It is believed that the first Maori to arrive in New Zealand traveled in waka from Polynesia. Totara is a species of podocarp tree endemic to New Zealand. 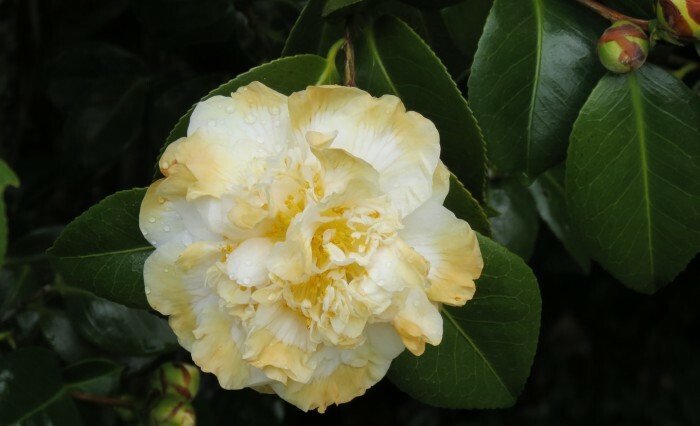 It grows throughout the North Island and northeastern South Island in lowland, montane and lower subalpine forest at elevations of up to 600 m.
While outside in the courtyard, a small, carefully manicured garden created a quiet respite from the noisy rooms within. 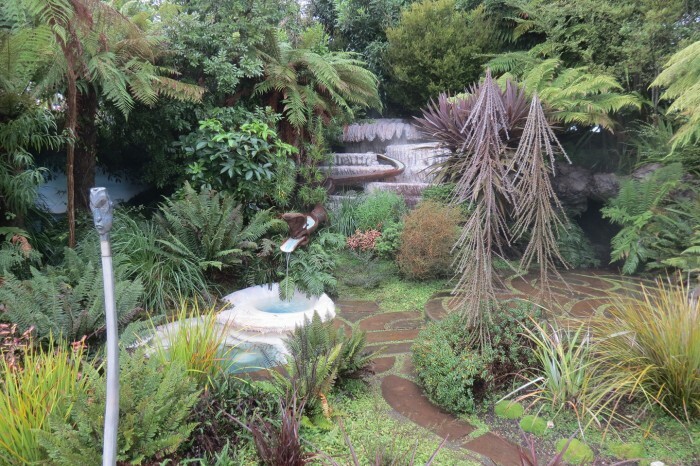 It featured native plants and included Maori culture, such as the forest got below. 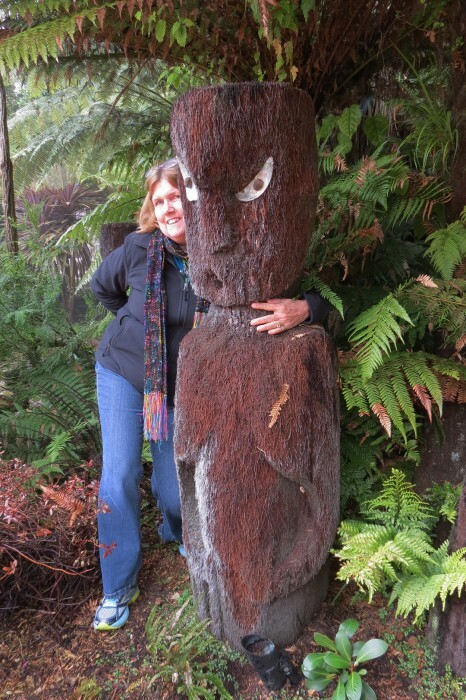 The Spirit that Dwells within the Tree Ferns – Several ponga tree sculptures present in the garden evoke the handiwork of Patupaiarehe, a tribe of forest guardians said by the Maori to play music and carve artworks. It seems particularly appropriate as my time in Taupo was rapidly drawing to a close and my next destination was Maungatautari, Sanctuary Mountain, a sacred place to yours truly. So long Taupo! It was wonderful to spend some time within your beautiful region! 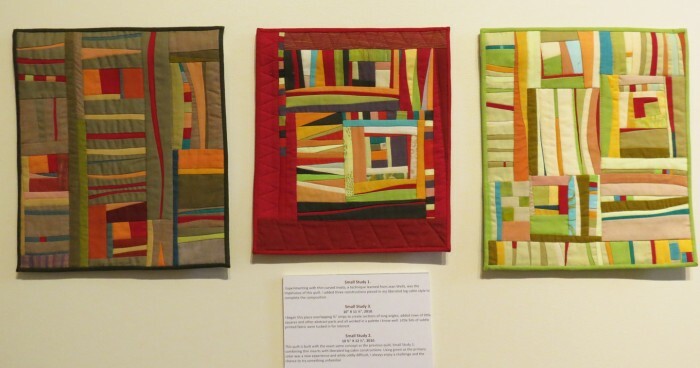 This post showcases more of the quilts on display at the My Place Exhibit at Taupo Museum. The text below each of the quilts shown here are the words of their makers. We all are part of a big universe. Looking up at the night makes me see the stars and a realization that I am part of this big, mysterious whole. My view of life is influenced by my beliefs. 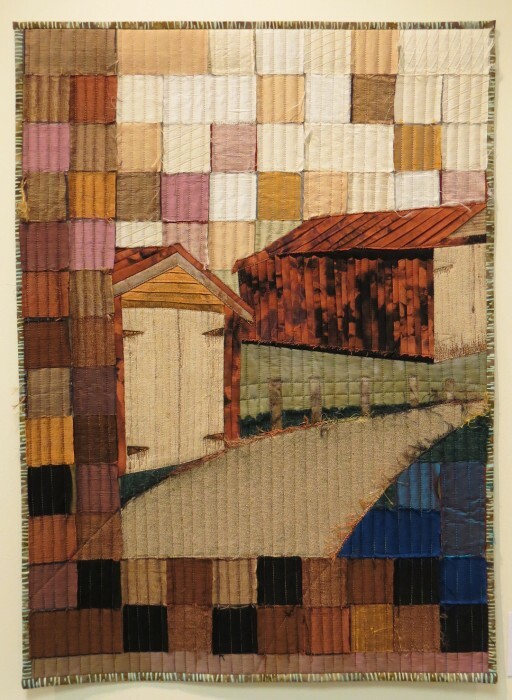 Embroidery made by Joan Bright and recycled into a wall handing by Aletta Lamprecht. 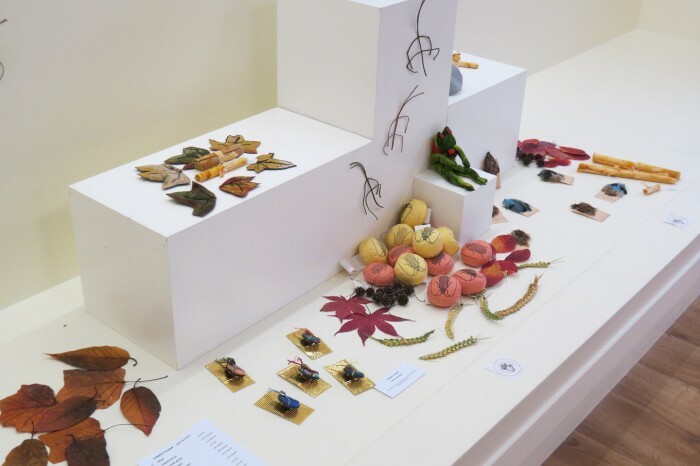 My Place also included a large number of small pieces including exquisitely detailed insects, and other three dimensional art. Inspired by the sunsets seen from home. Inspired by the Tongariro National Park and Celtic wave design: signifies Scottish roots. 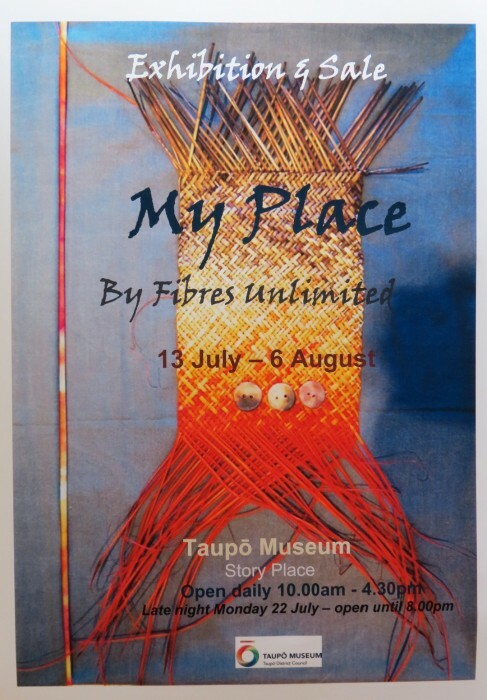 9 Ties for the 9 Artists involved in “Our Place” Fibre, Friends and two Islands. An expression of the weaving together of our lives inspired by our passion to create. When I first came to New Zealand, I would become terribly confused by direction. My inbuilt system told me that the sun would be in the south at midday. It took a while to recalibrate. Inspired by the amazing colors in the Red Crater – Mt. Tongariro. What talent, and what an amazing exhibit! Fibres Unlimited is group that formed with the goal of encouraging each other in creativity. Group members have very different strengths that made this project particularly rewarding. 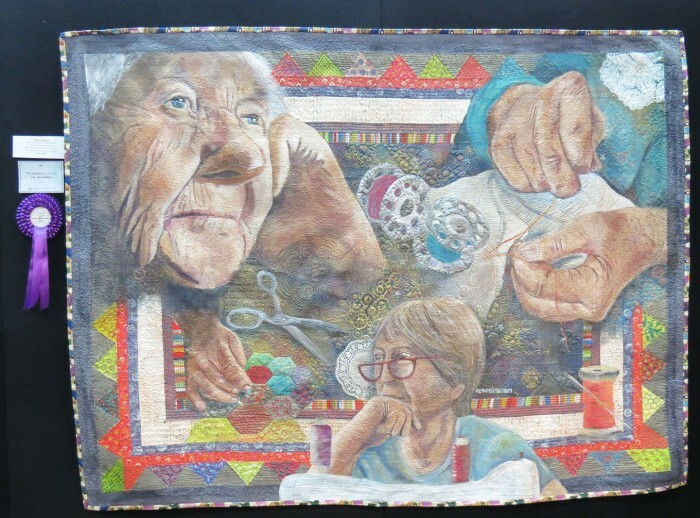 Joan Bright, a founding member of the group, now age 91, is no longer able to stitch but has inspired several pieces by sharing her stash when she was forced to downsize. Group members worked collaboratively over two years on this impressive exhibit, stretching their creativity as they worked together using techniques with which they were unfamiliar. 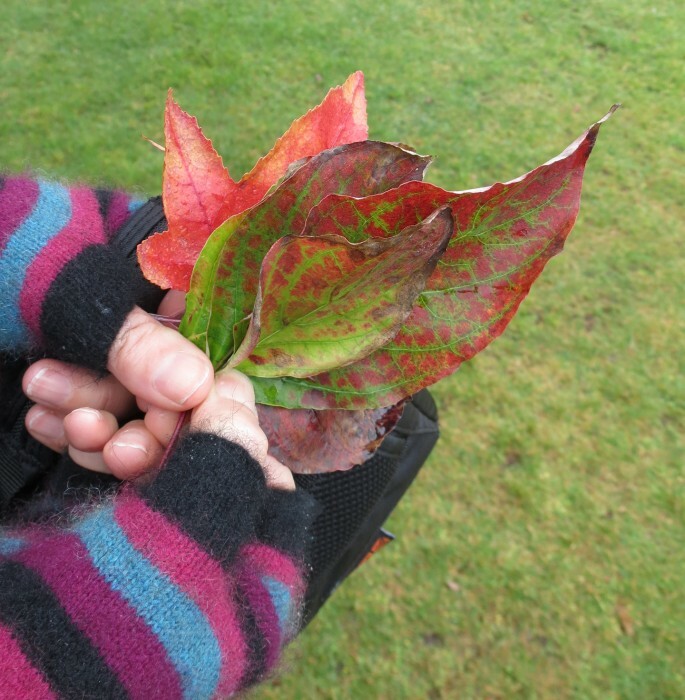 Fibres Unlimited dedicated “My Place” to the memory of Margaret Elizabeth Scott 1932-2013. Margaret was a superb needlewoman who was generous with her knowledge. 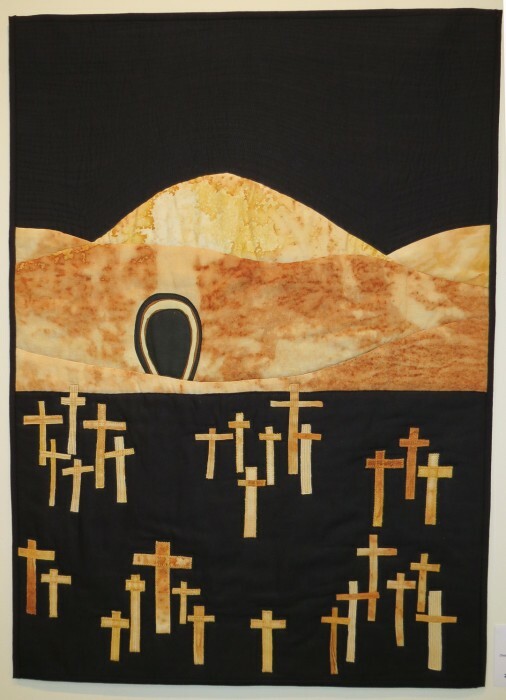 In exhibitions, her quilts were stunning in their conception and immaculate in presentation. The text below each of the quilts shown here are the words of their makers. Orakei Korako tells of the thermal activity present there. 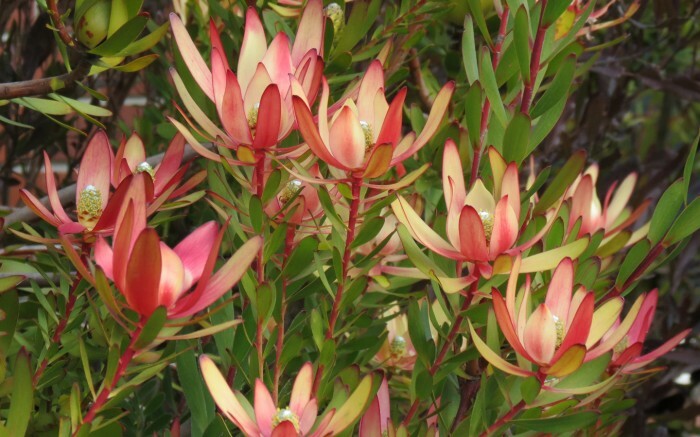 It produces stunning, ever changing color schemes. 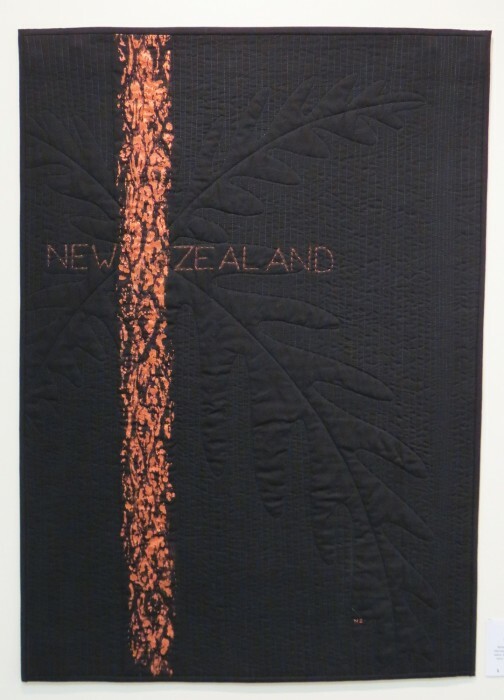 The quilts in this exhibit particularly spoke to me as they shared stories of their New Zealand, my other favorite country. It was evident through these quilts that the women of Fibres Unlimited have great love for their country and for each other. “When I was working on this piece, the London Olympic Games were on and New Zealand soldiers were being killed and injured in Afghanistan. I felt very blessed to have been born in this country. In Forest Magic, the roots of a tree that claws on bare rocks are supporting its magnificent tree trunk in one of the forests where I was tramping with a school group. 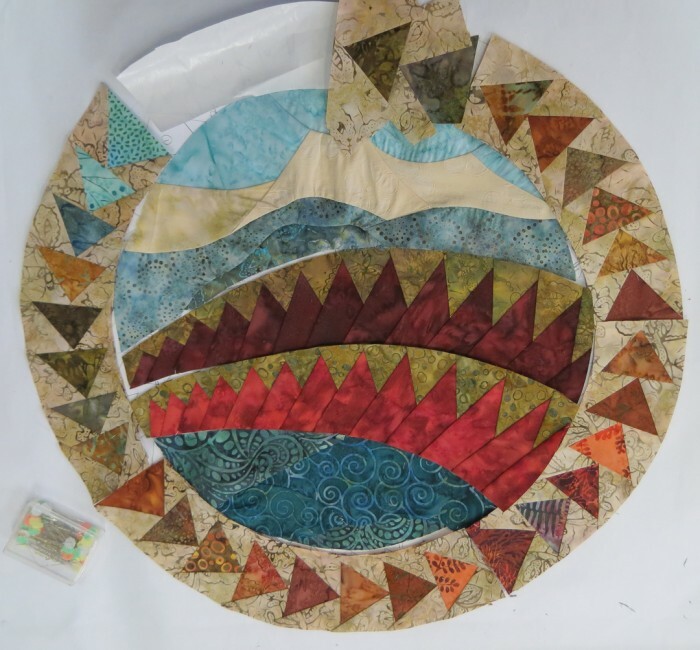 Piecing, discharging and quilting by Aletta Lamprecht. 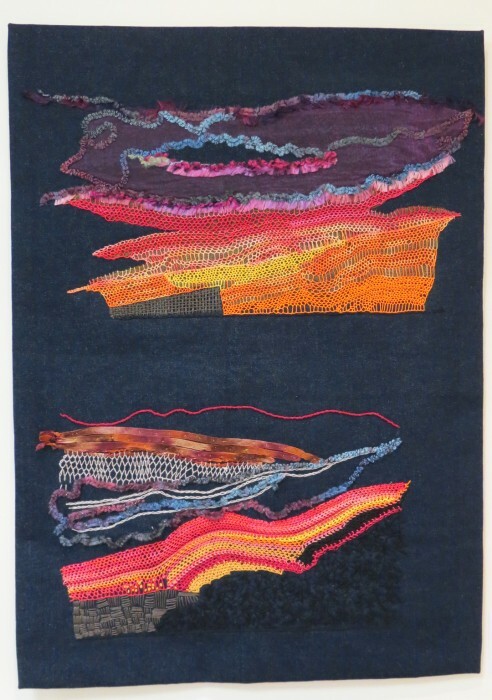 Felting, hand embroidery and hand quilting by Pene Williamson. As a child, there were many boatsheds near my place on the river. Purpose-built, no frills and usually slightly derelict. Aletta and I often walk, run or ride past these lakeside boat sheds. Deep in the hills of the Paparoa Range lie the bodies of twenty nine men. On Friday 19 November 2010 at 3:45pm there was an underground explosion at the Pike River coal mine. Twenty-nine men lost their lives, and their bodies have not been recovered. 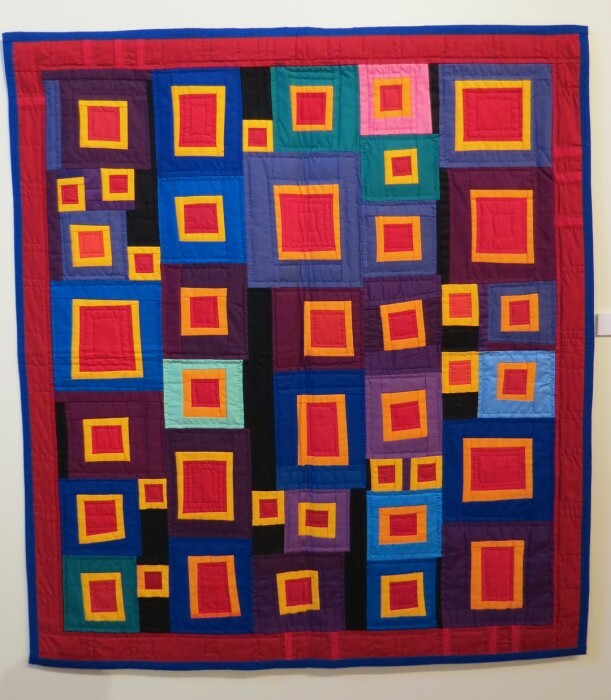 The remainder of the quilts will be featured in the next post. 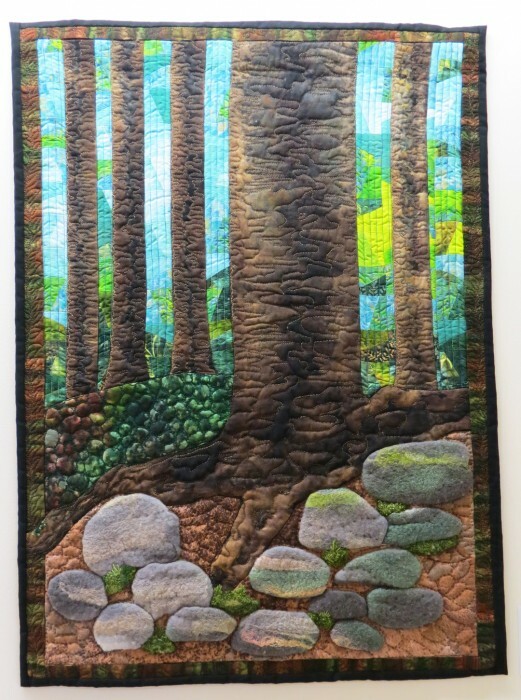 The Taupo Museum also featured an exhibit by Gwen Marston who has been quilting for three decades resulting in 440 small quilts. 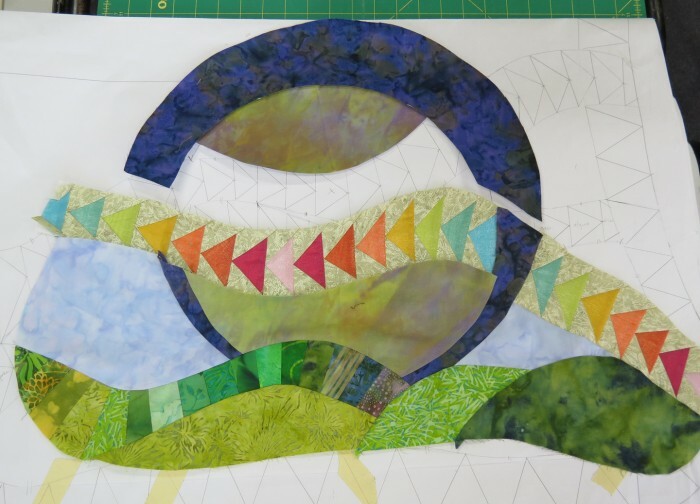 Gwen says that making small pieces allows her to experiment with many more artistic and technical ideas. She also believes that she feels that it helped her develop her own aesthetic more than anything else. 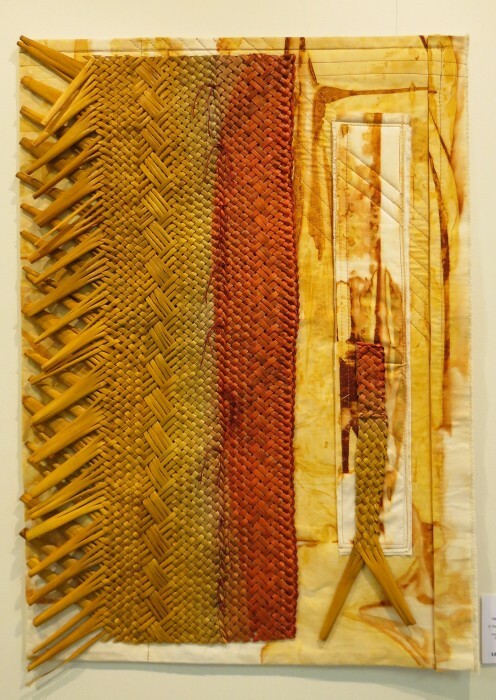 In 2010, Gwen began a new series of quilts that she calls, “Small Studies”. Her intent was to use the ideas of “the sketch” as way to push herself into creating as many different compositions as possible without repeating herself. 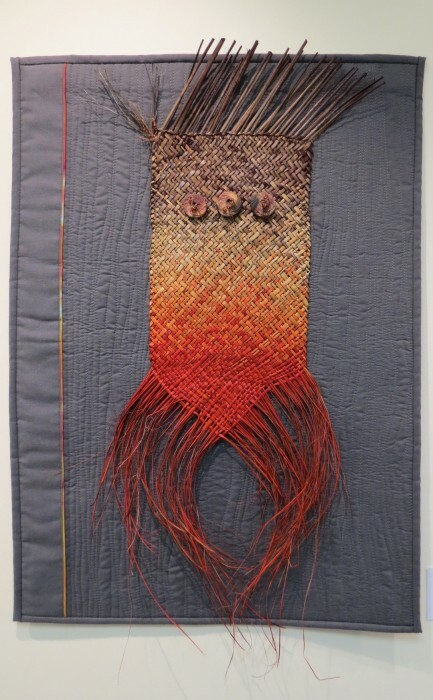 The brilliant, almost Amish colors in Gwen’s quilts makes them nearly leap off the wall. 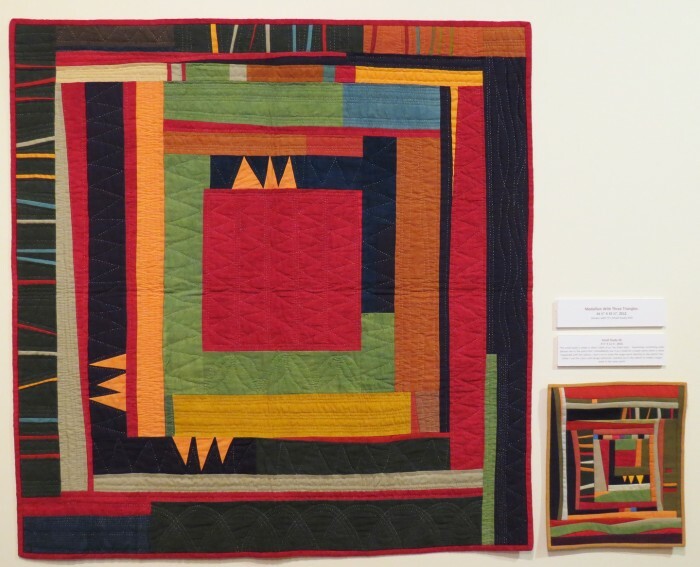 With an irrepressible eye for graphic design, each of these intricately pieced quilts is stunning, particularly so when hanging together in the large room of the Taupo Museum. The combination of large and small quilts with the same colors and similar shapes, also presents a powerful statement. 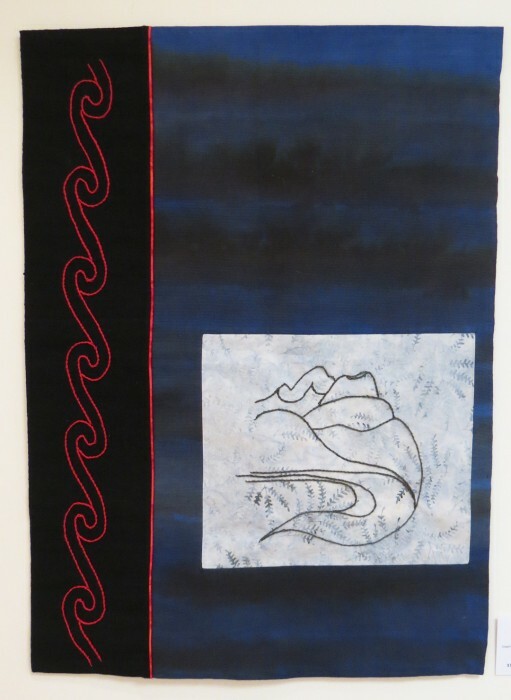 Gwen thinks of the small quilt in the above image as her “tribal style”. When something particularly pleases her, she immediately uses it as a study for a larger piece. This is what happened with these two quilts. She doesn’t try to make the larger work identical to the sketch, but uses the colors and design elements worked out in the small study sketch. 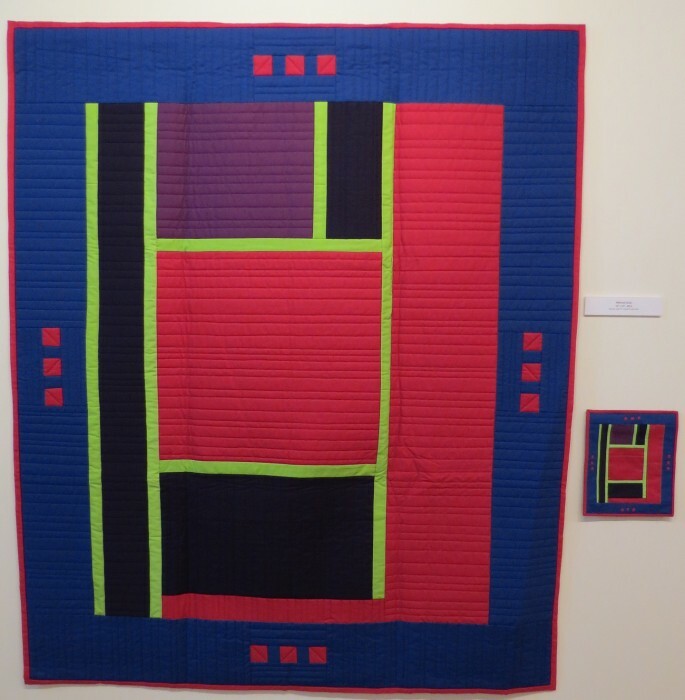 Gwen developed a strong appreciation for strong, saturated colors from looking at Amish quilt. Each of these studies were created in 2010. 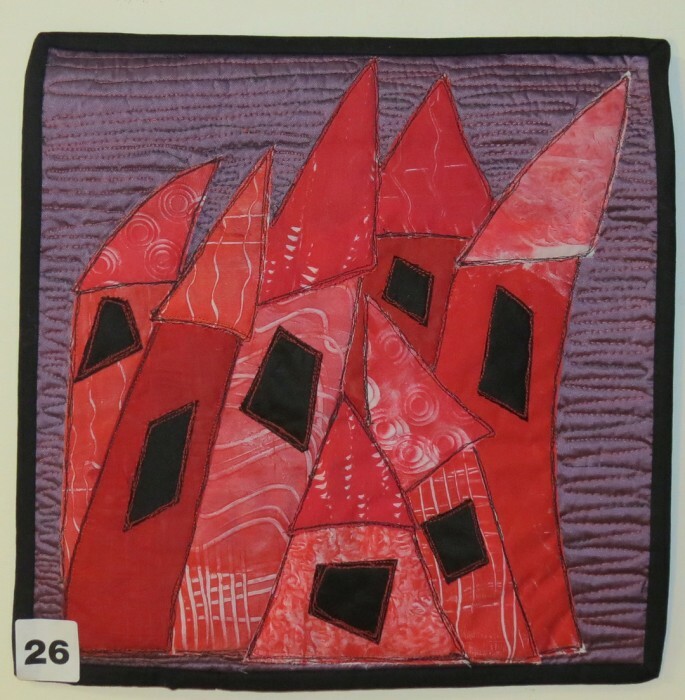 37 Sketches was a powerful exhibit of quilts reminiscent of an American style of quilting more so than those often created by New Zealanders. 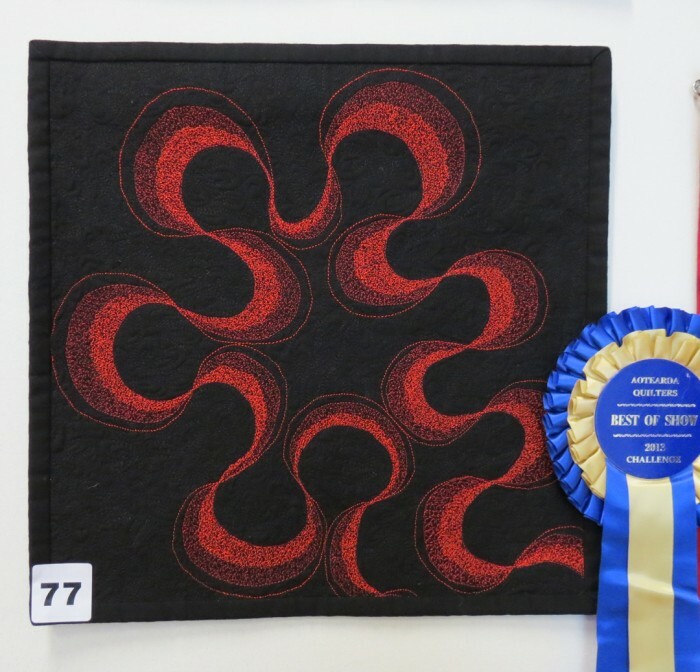 It was one of the four different quilt exhibits at the Taupo Museum during Symposium 2013. With Symposium 2013 at an end, I said farewell to new friends as well as long-time friends. My next few days would be spent with Marion Manson, the woman who is responsible for my love affair with New Zealand. Back in about 1990, Marion purchased a pattern from me. It was my first overseas order and I was so excited that I wrote to her. She wrote back and soon we were dedicated pen pals — this was in the days before internet! Marion was on the organizing committee of Symposium 1997, held in Hamilton and I was invited to teach there, my first New Zealand Symposium. 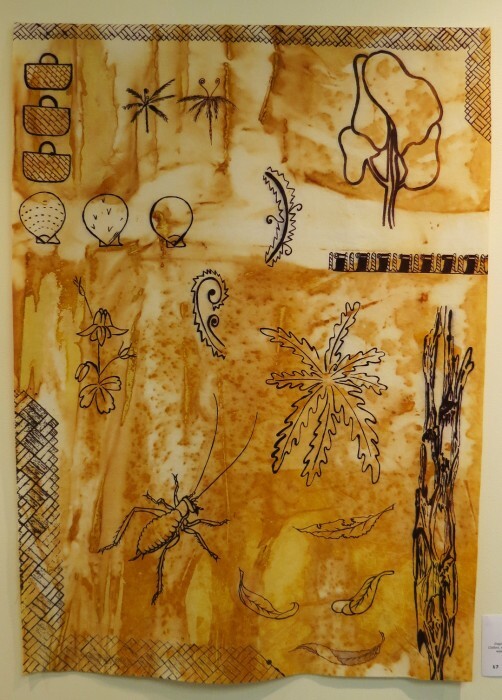 Marion works in natural dyes on different fibers and it active in the art community throughout New Zealand. First on our agenda for the day was the Taupo Museum, except that some shop windows beckoned along the way. In honor of the Symposium many of the shop windows were beautifully decorated. Without a doubt, this was my favorite shop window! And, I left a goodly amount of cash with them for safe keeping! I walked out sporting a new jacket. We found this lovely hand woven piece at the Woolshed, where many of the woolens and possum-down items were on sale. I left some more cash there! It was beginning to look like an expensive day. 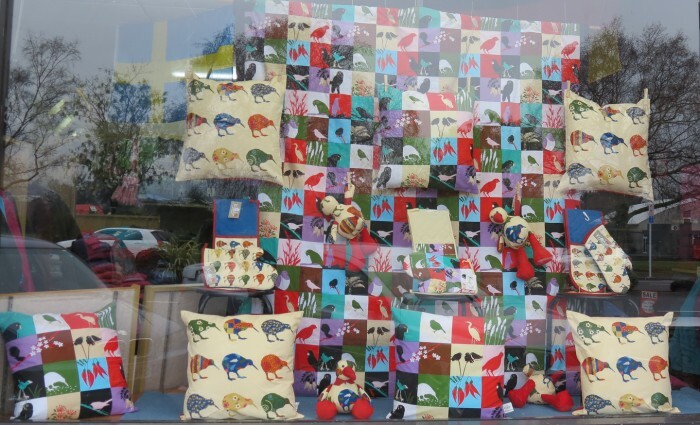 But, we soon returned to our mission of the day – the many special quilt exhibits at the Taupo Museum. The first exhibit that caught my eye was right inside the front door. 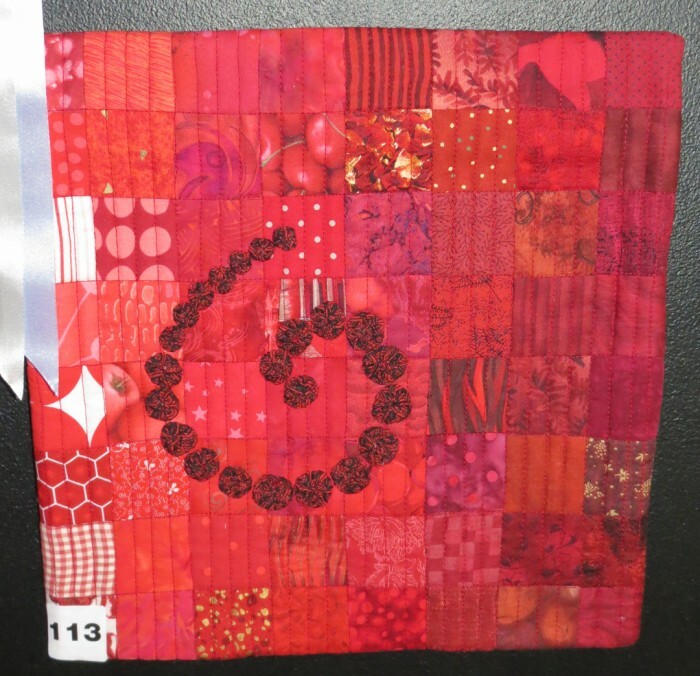 Covering two free standing panels were row upon row of 12″ square little quilts, all done in shades of RED! 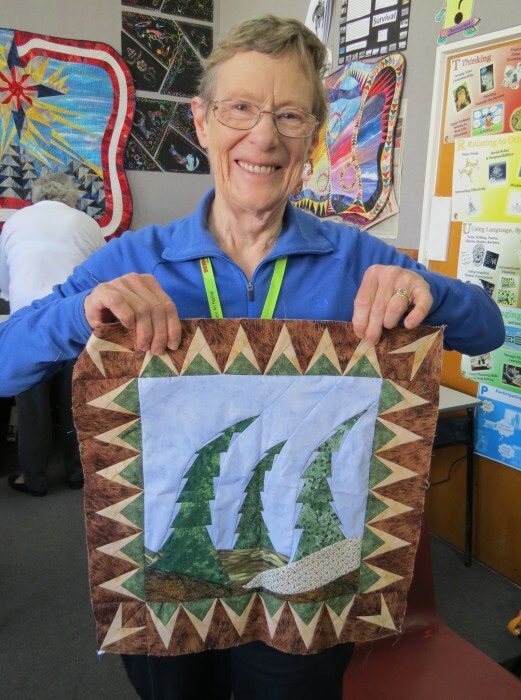 The Red quilts at Taupo were a challenge given by Aotearoa Quilters. 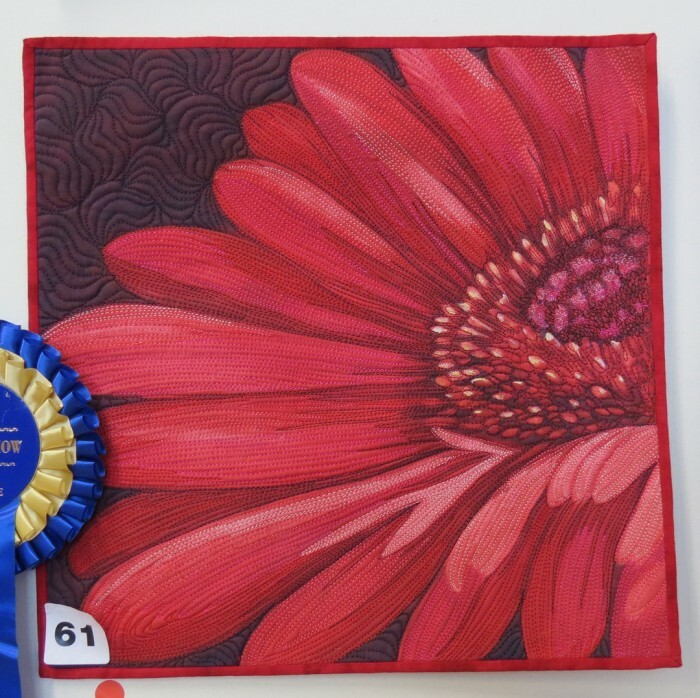 The winner was the lovely gerbera by Sonya Prchal. There were 137 entries from all around New Zealand. The quilts were all for sale, cash and carry, and the remainder will be shown at the Stitches and Craft show in Hamilton 7th/8th September. Many thanks to Janet Ryan, of New Zealand for the above information. Here are a few of my favorites. If anyone knows the names of the quiltmakers of the other quilts, and their stories behind these little quilts, I would sure appreciate that information. Back outside, another shade of red caught my eye. . . Laying in the wet parking lot, amid the parked vehicles, someone had discarded an apple core. 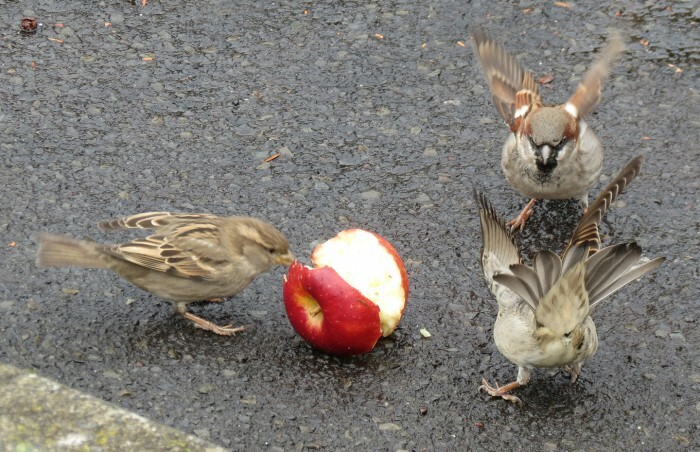 It seemed to be just the meal the local sparrows hungered for. Although all looks peaceful in this image . . . Guarding one’s feast might just make winter survival a little easier. Marion also was attracted by the outdoor colors. 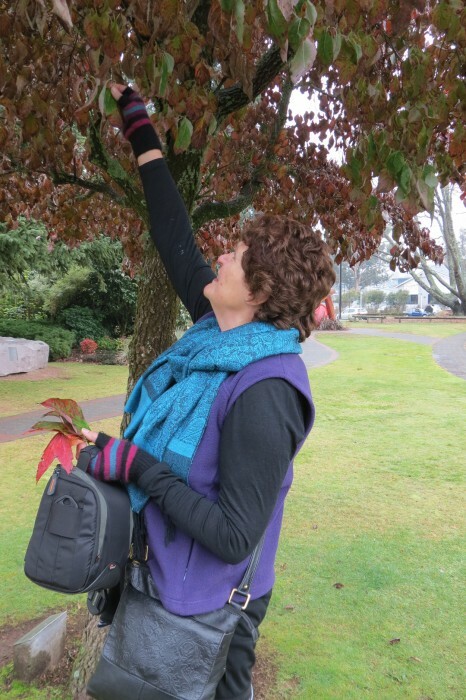 It doesn’t take long to discover that Taupo boasts a burgeoning art community, well supported in their local community. 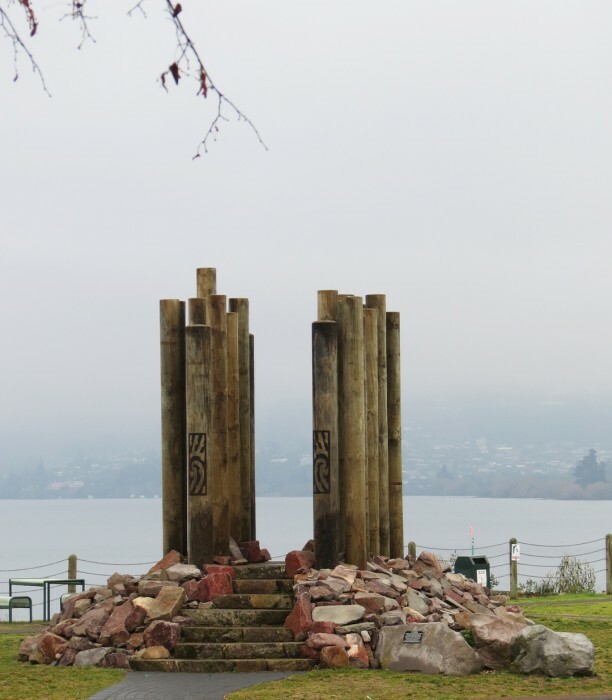 Although I was did not capture the specifics of this sculpture that looks out onto Lake Taupo, its majesty sets the tone for art in the downtown area. 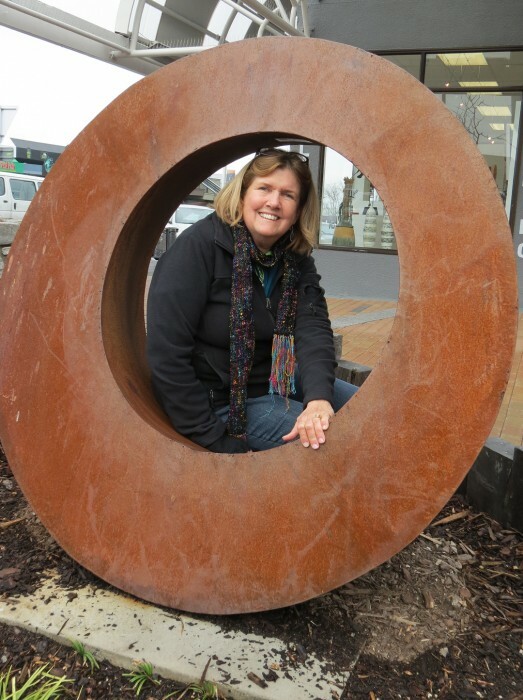 During the course of my meanderings, I found many of the sculptures highlighted in the “Walk the Sculptures of Taupo” brochure. 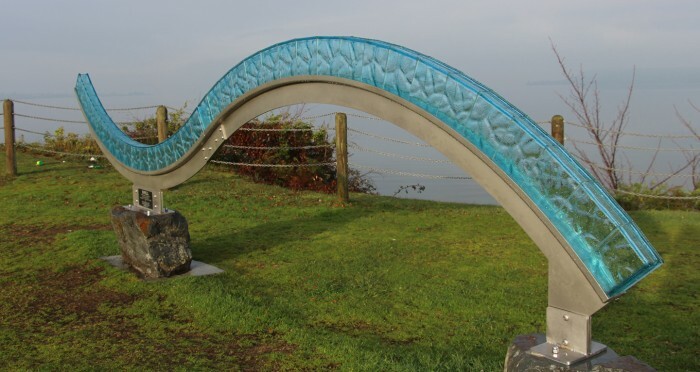 Much of the art has been funded by the Taupo Sculpture Trust that began in 2008, by a small group of art lovers who decided the time was right to add some dynamic shape and culture to the Lake Taupo Region. The Trust is now registered as a New Zealand Charitable Trust. 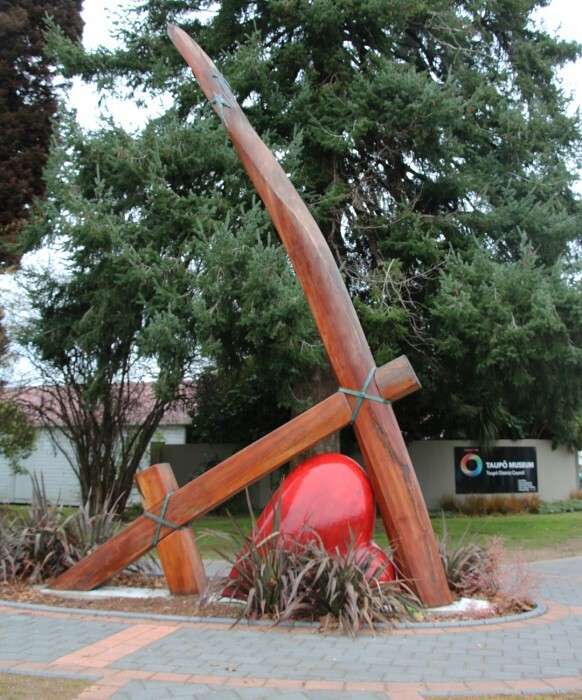 In the above piece, Heartland, the red heart of North Island is set under a matai structure with bronze strap as a tribute to the early New Zealand settlers. 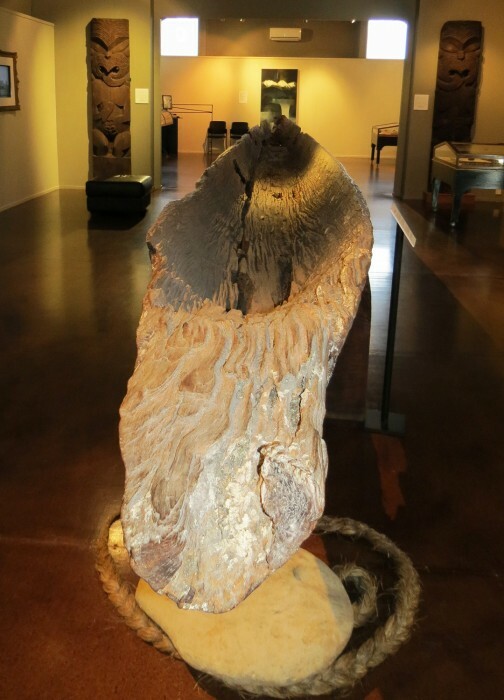 This Sculpture symbolizes the gifts of bird and stones of the Te Arawa voyagers. 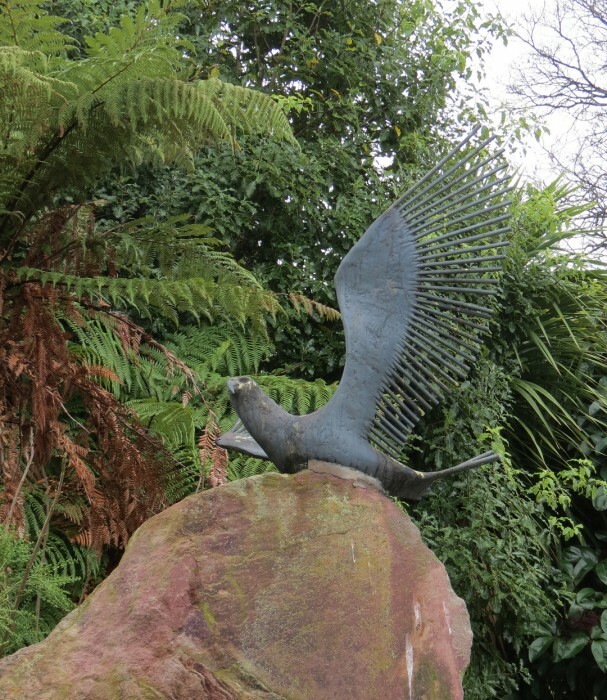 The Tuwharetoa people left birds and stones on the shore of Lake Taupo to protect and guide all followers. This sculpture, created from stainless steel and glass, represents a long wave length surface that travels long distances across a body of water. It embodies a light hearted sense of fun as well as an environmental message. 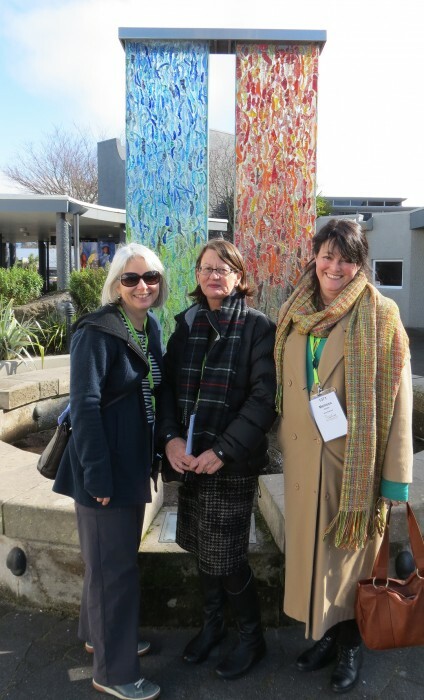 My friends, Melissa and Diane, posed in front of this piece which is the first sculpture commissioned by the Taupo Sculpture Trust. It is set on the plinth of local volcanic rhyolite rock and symbolizes the two sides of the legendary cloak. The glass feather depict the lake, sky, river, and volcanic Earth. In addition to the art listed in the brochure, we also found other art, scattered throughout the downtown area. My friend Marion Manson snapped this photo right outside the Replete, the cafe where we ate lunch! And, a delicious lunch it was too. 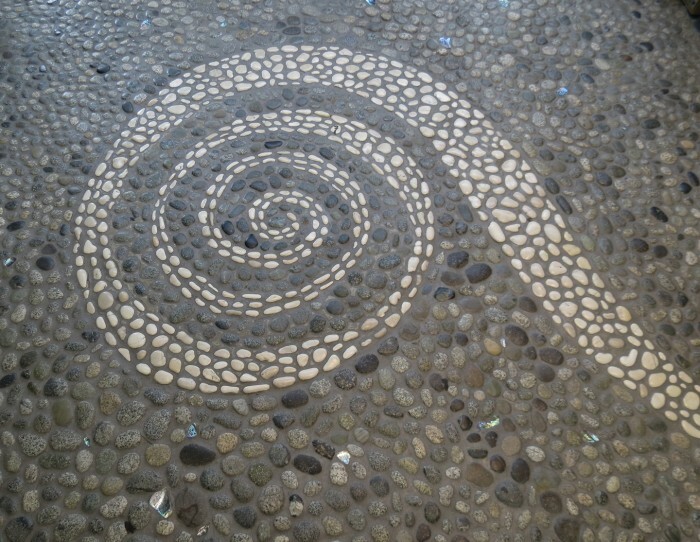 Even the flooring was artistic, as evidenced by this stone Koru that was the flooring in the local sport shoe shop. Art is everywhere in Taupo! Check it out next time you visit. My second class at Symposium was the three-day Flying Colors Class where each student designs their own project. During the span of only three days, it is unusual for anyone to complete a quilt top, so this is a selection of works in progress! 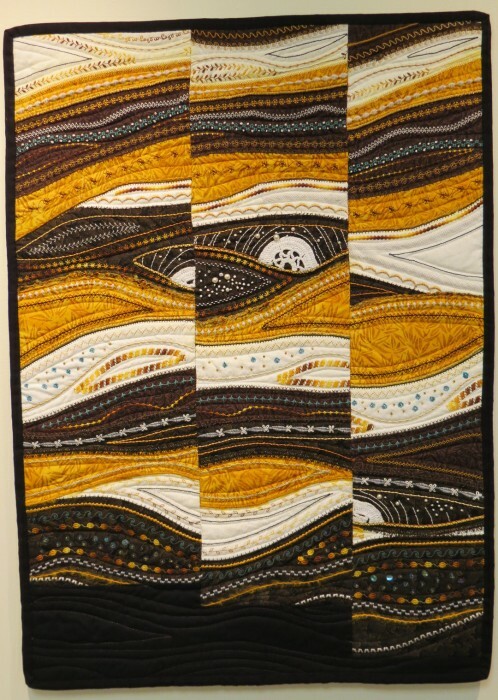 However, Sheila Christensen, who was working on a guild challenge, did finish all the stitching on this small quilt top! I love the way she used the sepia tones to achieve the look of a well-aged piece. 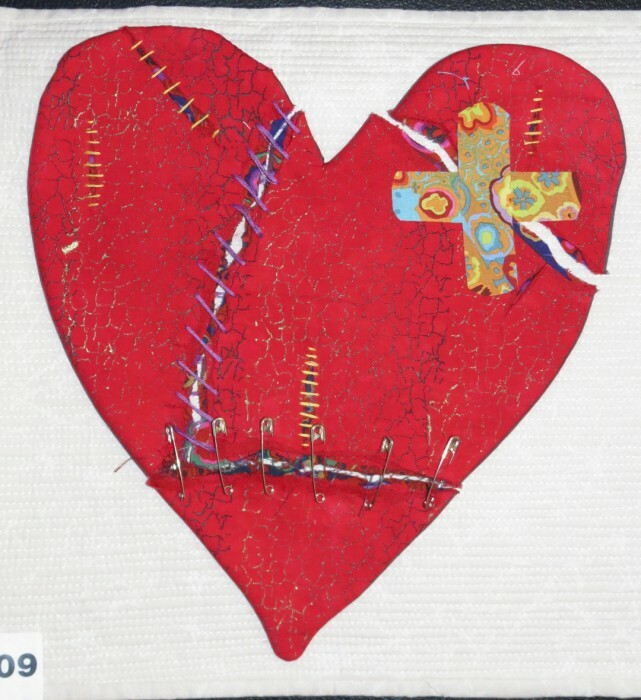 Maureen was not sure that she would be able to create and stitch her own design and asked for a pattern. However, she really got into the drawing and actually got more sewing done on her original design than most everyone else. 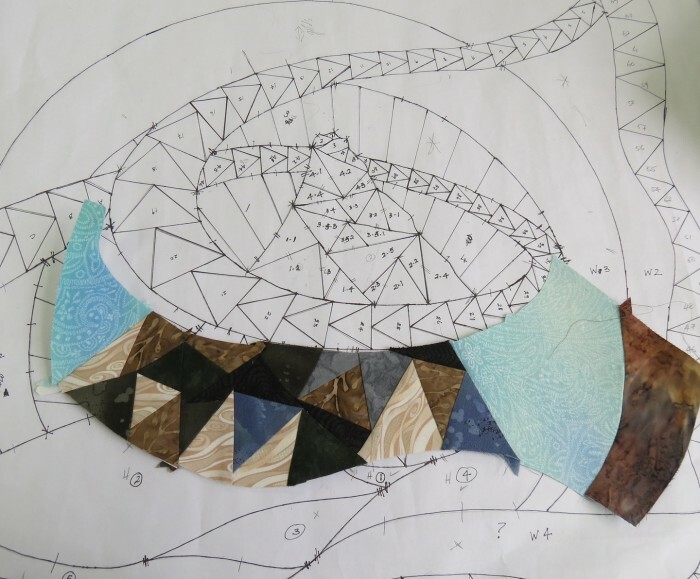 Pam Pengelly, very nearly completed her Taupo inspired design with the Tongariro Mountains in the background. 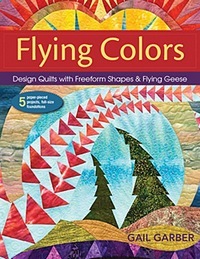 Somehow, I did not manage to get a photo of Marilyn Foreman’s new design, but here’s the one she brought with her to class. She made the Tiny Trees from my pattern, but then created her own Pointy Dudes border. And, through all of this, even though it was the dead of winter, the magnolias blossomed outside our classroom. It was a joy to teach and be in the presence of the wonderful women who took this class. I look forward to seeing photos of their completed projects sometime in the future. Classes held one last surprise for me during my walks to and from the campus each day. Toward the end of the week, the full moon shone brightly over the city, almost as if celebrating all things Symposium! Thanks so very much to all of the students, the organizers, and the staff who made this such a wonderful experience!